2017 marked the sixth straight year that college enrollments declined in the United States. University and college administrations are turning to new options to maintain revenues, including focusing on student retention as a way to keep enrollment rates steady. In fact, many university chief business officers now cite ‘retaining current students’ as a top priority. Retaining current students is much more cost-effective for higher education institutions than recruiting new ones, but only 54.8% of students graduate in six years. Many institutions are now prioritizing targeted interventions through student services to drive student success and increase retention rates. Studies have shown that identifying and targeting the most at-risk students and providing effective interventions can potentially lower the dropout rate. Academic advisors can help students succeed by providing access to important information and guidance about courses and majors. Beyond informing students and better preparing them to grow at the institution, academic advising also gives students a personal connection to the college or university. Academic advisors can be advocates for students, guiding them through difficult choices and acting as soundboards for student frustrations and fears about their post-secondary education experience. These advisors provide personal support, ensuring students have the resources they need to flourish at the institution. The personal relationship that develops from this is imperative to driving down the student’s drop out risk. Advising appears to be most useful when combined with other retention practices. When paired with on track indicators, academic advising can be especially pivotal in retaining at-risk student populations. By flagging students with known drop out risk, such as undeclared majors, the school can use academic advising to support students through long-term course planning and mentorship. The University of North Carolina Greensboro, for example, created an advising team to work with students who had not yet declared a major after data revealed these students dropped out in higher numbers. The University provided undeclared students with more frequent and targeted advising and mentoring support to help them declare a major within their first year and become strategic about long-term course planning. As a result, between 2011 and 2014, retention among undeclared students increased from 76% to 80%. According to a large-scale survey of retention and college completion indicators, private four-year institutions rated academic support programs and services as the most effective strategy for retaining students. Strategically targeting first-year students, students in courses with high failure rates, and academically at-risk students can decrease the dropout rate among these populations. Peer tutoring, small discussion sections for gateway courses, and major-specific learning centers are all commonly used forms of academic support programs. Whereas academic advising fosters a personal connection with the institution, academic support ensures that students are getting the learning resources they need to succeed academically. For a relatively low cost, universities can hire students to their academic resource centers, planning groups, and one-on-one tutoring sessions. The University of Southern California hired upperclassmen to sit in on especially difficult introductory engineering courses and then hold weekly, voluntary discussion sessions. Providing these resources can significantly increase the likelihood of academic success among at-risk student populations. 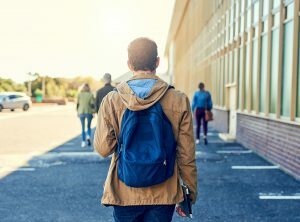 Increasingly, universities are adopting remediation strategies to lower the dropout risk, with studies showing that between 28% and 40% of all first-time undergrad students enroll in at least one remedial course during their college career. The most effective remediation strategies include screening programs to sort incoming students into appropriate course levels and hands-on support programs, including summer bridge programs. Screening practices ensure that students are placed in proper class levels to match their abilities. Institutions can use outside benchmarks, like the College Board’s ACT, or internal assessments for each level. Due to the variety in screening practices, there is not a strong consensus among higher education institutions about preparedness, making remediation recommendations more difficult. In response, there is a growing focus on high school transcripts. Research points towards high school GPA and overall high school performance act as better indicators for college performance, with fewer misplacements and higher rates of success in college courses. Summer bridge programs allow institutions to deliver remediation courses during a student’s transition to college. Helping students adjust academically and socially to college, effective summer bridge programs reduce the need for developmental courses, provide face time with faculty and administrators, outline academic and social expectations, and offer social networking opportunities. Although effective, summer bridge programs face obstacles like the cost of recruitment, mixed-ability classes, and lack of program knowledge.